Built to commemorate the original, today's Nice Price or Crack Pipe Hurst/Olds isn't your father's Oldsmobile. That is, unless it just so happens that your father was wicked cool in the '80s, then it just might be. Will this one's present price however, make papa proud? Despite some questionable mods made in its restoration - like too small tires on too gaudy ofwheels - yesterday's tidy '89 Mercedes 190E made the grade, winning a narrow 53% Nice Price win. Those wheels being optional may have had something to do with the result. Almost all the options is what today's 1984 Hurst/Olds apparently carries, as it seems to be decked out in almost every bit of '80s finery that the defunct brand could have mustered back in the day. It's also got more shifters than you can shake a... well, you know... at. The '83/'84 Hurst Olds' were offered to commemorate the 15th anniversary of the original 1968 edition. Offering a 4bbl 307 with 180-bhp and 245- lb-ft of torque these were the hottest things Olds offered at the time. A THM200-4R and 3.73 rear axle completes the package, and a Hurst Lightning Rod shifter gets the work done. The '83 cars - all 3,000 of them - were black over silver, while in '84 they, like this example, flipped that combo, offering as the exclusive paint scheme sliver over black. A little more than 3,500 cars were built in the model's second and final year. This dealer-offered one seems to have skipped both the T-top and Moonroof options, but it looks to be otherwise as loaded as Gary Busey. The Hurst package carried the W-40 code and the conversion to Hurst-dom was carried out by a Detroit company called Cars and Concepts. The car seems to be all original and carries just under 60,000 miles according to its odometer. Of course that odometer being five digits plus tenths, that could be 160K, 260K, or who knows-and 60K. I'd like to think about that but my attention is drawn to the crotch cooler below the steering column. I love those things! I should also note that the steering wheel itself is all kinds of weird looking. Other aspects of note in the interior are its rich bordello red color scheme and flat as as a plains state bucket seats. The driver's throne seems to be missing some trim at the bendy part and there's some wear and tear here and there, but otherwise it seems like a pretty nice place to be. There's also that Hurst shifter sprouting sticks every which way like some sort of fungal growth, and I'd recommend reading the manual before moving any of them other than the big one on the left. On the outside, things looks similarly tidy, although it is noteworthy that the car still seems to carry both all its original special trim and remains shiny and presentable after all these years. The ad doesn't give any mention of mechanical condition, but aside from the shifter these things are pretty much Fred Flintstone simple so there's not much to go wrong. One way to go wrong with the car is paying too much for it. At $15,995, it's not exactly cheap, but unlike the Richard Petty Pontiac from Tuesday, this is a special edition that people might have actually heard of and remember, which could mean it will appreciate in value. 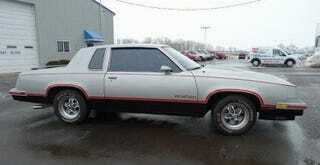 What do you think about that price for this Cutlass? Is $15,995 an amount that could make you interested in this Olds? Or, does that make you think this Hurst is the worst? Buckeye Ford out of London OH, or go here if the ad disappears. H/T to Cortezcowboy for the hookup!